December 2, 2015 / Comments Off on Welcome, Tide! 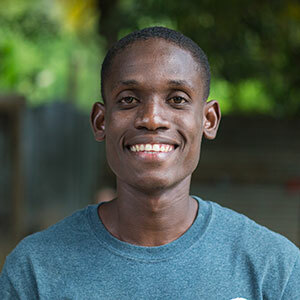 Tide has been helping all of us at Fond Blanc for the past few summers, and now Tide has been asked by Pastor Jean Claude to come and serve as the new resident translator and driver for our interns. Born with the given name of Rodchild D. Blanchard, “Tide” (sounds like tidy) is an easier nickname that is well-suited to such an affable and engaging young man. Tide has been translating for visiting missionary teams at Fond Blanc for the last three summers, and is widely liked and respected for his constant good humor and his warm friendship. He knows the children and staff well, and we are excited to have him on the team! Tide is completing his college education also. His school is close to the nearby town of Cabaret so he will be juggling classes along with his duties to the orphanage, but both and he and Pastor felt that he could manage both responsibilities. So… welcome, Tide!